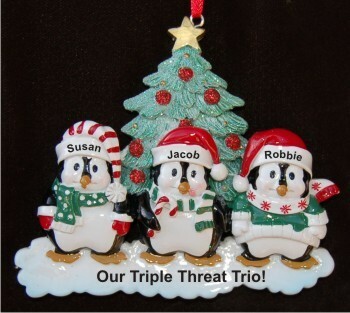 These 3 adorable penguins are up bright and early celebrating the holiday next to their bright and cheery Christmas tree. Personalize with the year, each penguin's name, and your unique custom sentiment. The resin ornament measures 4"H, and includes our holiday cord for convenient hanging. To complete the presentation, the grandparents ornament arrives nestled in our velvet bag.